TagoIO is fully integrated with RadioBridge devices, that are connected over Sigfox or LoRaWAN, by providing the perfect integration with the Radio Bridge backend. For more information about Radio Bridge click here. All data sent by your device will be readily available to be displayed in widgets or processed by your Analysis. You can perform uplink and downlink operations. When your device sends data to TagoIO it is performing an Uplink operation. After configuring your device on RadioBridge console following the developer's documentation, you need to set up a Callback API . Go to your RadioBridge Console, and enter the Callback API page. Here, you need to enter TagoIO callback URL and set an Authorization Header of your choice. The Authorization is not required, but it adds security to your integration. Type any secret text there, and use the same text in the verification code when registering at TagoIO (Step2). Save the Unique API URL and the Authorization Header to use in the next step. Add the device at TagoIO. 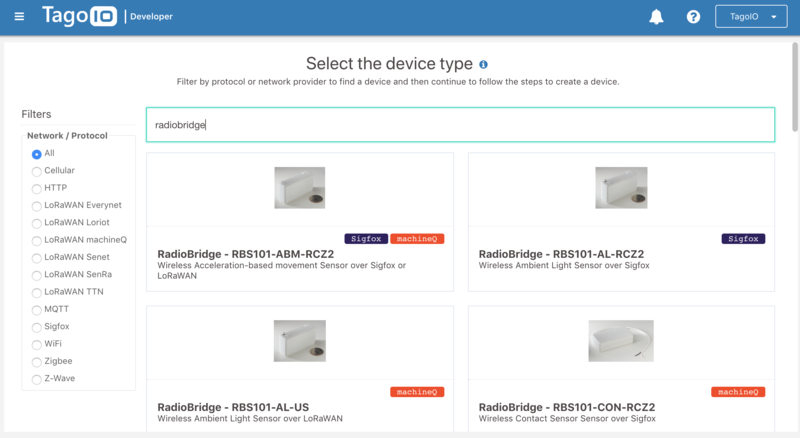 Go to Devices, click on 'Add Devices', and search for RadioBridge to pick your device from the list. Then, just follow the directions to integrate your device with TagoIO and start to build your own application. You'll be requested to enter the Device ID, the Authorization Header and the Unique API URL. All of them can be found in your RadioBridge console under Devices and Callback API pages (Step1). When completed, click on 'Create Device'. Turn your Radio Bridge device on, and wait for the data to arrive and hit your data bucket! Every time the device sends data it will be available in the bucket and shown in the dashboard. Depending on your type of device, a Parser may be automatically added. You may want to edit the parse function in your device if necessary. To send data back to your device, just go to the device list, select the device, and go to the 'Configuration Parameters' tab. Here you use the parameter downlink. Set it the "Was it sent? to No and enter your downlink message in the value field. When your data is sent to RadioBridge and scheduled to send to your device, your parameter will be marked as sent (Yes). To send the message again, set the switch to as not sent (No). Enjoy your Radio Bridge device with TagoIO!